This strain was isolated from grapes grown in the Côtes-du-Rhône region of France by Dr. Dominique Delteil, head of the Microbiology Department, Institut coopératif du vin (ICV), in Montpellier. ICV D-47 strain was selected from 450 isolates collected between 1986 and 1990. Oenological properties and applications The ICV D-47 is a low-foaming quick fermenter that settles well, forming a compact lees at the end of fermentation. This strain tolerates fermentation temperatures ranging from 15° to 20°C (59° to 68°F) and enhances mouthfeel due to complex carbohydrates. Malolactic fermentation proceeds well in wine made with ICV D-47. 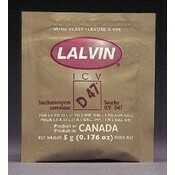 Recommended for making wines from white varieties such as Chardonnay and rosé wines. 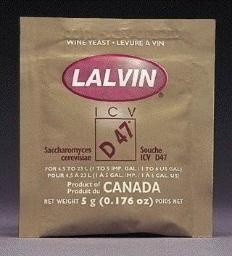 An excellent choice for producing mead, however be sure to supplement with yeast nutrients, especially usable nitrogen. An excellent choice for dry whites, blush wines and residual sugar wines.